StageBuzz.com: Where pride indeed goest before the fall - "King Lear"
Where pride indeed goest before the fall - "King Lear"
There's a surprising amount of humor and wit to be found in even the darkest Shakespeare plays, as wonderfully shown in the Donmar Warehouse's very satisfying production of King Lear at the Brooklyn Academy of Music, starring Derek Jacobi in the title role. In ancient Britain, the aging Lear, tired of a lifetime of royal responsibilities, decides to spit his kingdom into three equal portions, giving one segment to each of his daughters. However, first he asks his children to state just how much they love him. 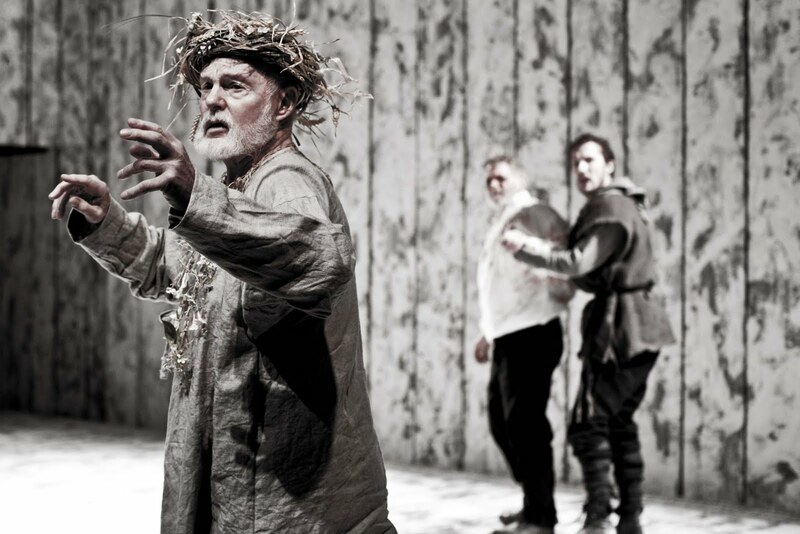 His two married daughters Goneril (Gina McKee) and Regan (Justine Mitchell), with their husbands looking on, loudly proclaim their undying and all-consuming love for Lear, who laps up the attention eagerly. (There's a wonderful bit of business with how and when each daughter kisses him during this sequence.) But when the youngest and as yet unmarried daughter Cordelia (Pippa Bennett-Warner) refuses to tell her father what he wants to hear, reserving her most powerful love for her future husband, Lear flies into a rage, banishing Cordelia from his sight after giving her to the King of France (Ashley Zhangazha), the only person who will accept Cordelia without a dowry. Caught up in the angry verbal crossfire is the loyal Earl of Kent (Michael Hadley) who, after desperately urging Lear to forgive Cordelia, is also ordered banished from Lear's domain. However Lear's retirement doesn't go as planned. While intending to live with Goneril and Regan on alternate months, the two daughters quickly tire of this arrangement, and of having to feed and attend Lear and the 100 knights who accompany him. As such, they quickly close their doors to their father, stripping him of his entourage in the process. The resulting effect of Lear seeing the rug of his authority quite literally pulled out from under him threatens to send him over the edge into madness. While all this is going on, there is also a subplot where Edmund (Alec Newman), son of the Duke of Gloucester (Paul Jesson) conspires against both his father and brother Edgar (Gwilym Lee) to gain control of the Duke's land and title. Edmund is illegitimate and while there was "great sport in his making," as his father points out, Edmund has no intention of watching his father's estate and power pass to Edgar, the legitimate heir. These two plot lines meet, separate and meet again several times before the final curtain. King Lear is a work that lives or dies on the title character and thankfully, Jacobi gives a standout performance. The actor initially plays the role as a sort of aged, preening fellow who has grown somewhat complacent over the years. His major blind spot is his own ego, never dreaming that those who profess their love will eventually turn on him. All this leads to a remarkable transformation of the character when circumstances reduce him to little more than a beggar with only a few companions (including Kent, who has returned in disguise to become a servant of the King). Indeed, Jacobi spits out the line "How sharper than a serpent's tooth it is to have a thankless child" as if were a hail of bullets. Every word, syllable and nuance filled with angry, righteous, and yet ultimately impotent venom. Even in the play's darkest moments, director Michael Grandage is able to evoke laughs. Such as when the addled Lear finds Edgar, who has disguised himself a mad beggar, and asks him if Edgar's daughters (he has none) are to blame for the young man's condition. This theme is also repeated in the not-often-seen "trial" of Regan and Goneril. One of the main attractions in King Lear is seeing just which of the secondary scenes or sequences (i.e. those not totally essential to the plot) make it into the final staging in any particular production. In this case, great emphasis is placed on the Fool (more than ably brought to life by Ron Cook), with his corny jokes, shameless mincing and speaking numerous harsh truths when repeatedly chiding Lear for giving up his throne, and how in this case wisdom definitely did not come with age. There are many times when it appears that Lear is actually the fool, and the Fool is by the far the smarter. Another character open to numerous interpretations is Edmund, here portrayed by Newman as a sort of angry rogue, but at the same time having enough charm to tempt both Goneril and Regan from their husbands' beds, coupled with a bemused sense of wonder that he is actually able to get away with his schemes. Yet at the same time there is no denying the hatred he feels for a condition of birth of which he had no control, as well as his complete lack of remorse against the innocent and not so innocent victims of his actions. Unfortunately, while Lear, Edmond and the Fool all get their moments in the spotlight, many of the other characters don't fare as well. McKee and Mitchell, while both sweetly malicious at times (such as when they pass sentence on their father), feel almost interchangeable, neither really having their own identity. Bennett-Warner makes a good Cordelia, but has too little stage time in order to make a strong impression. 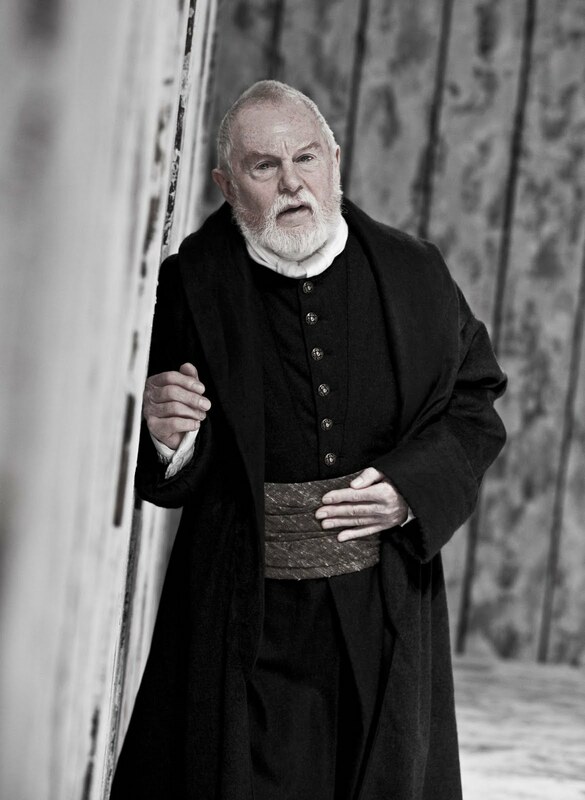 (Her first scene with Lear is overshadowed by Jacobi's actions.) Jesson is fine as Gloucester but there's nothing in his performance to make him really stand out. (Same comments for Gideon Turner, who plays Regan's husband, the Duke of Cornwall.) Faring somewhat better is Tom Beard as the Duke of Albany, initially a sort of cuckold (married to Goneril) who slowly becomes a man in own right. Hadley is quite good as the valiant Kent, who would lay down his life for his king, while not at all afraid to get his hands dirty if need be. Lee is okay as Edgar, likable enough in the role but not all that particularly memorable. Grandage's direction works well in telling the central stories, as well as when it comes to making the lead characters stand out. However, in making the entire work come together, his efforts fall a bit short. Some of the dialogue in the beginning also feels a bit rushed. Christopher Oram's use of sets, basically a series of walls with minimum props, is an interesting choice. However when you go for the minimalist approach, the transitions between the scenes need to be especially sharp, which is not always the case here. Plus, for those who don't know the play all that well, it can hurt if you have to take a moment or two to figure out where the scene has shifted to, and when. Lighting by Neil Austin is fine, sound design by Adam Cork is quite good. (There's a nice transitional effect during the storm scenes, switching back and forth from being outside in the elements to inside Lear's thoughts.) Fight direction by Terry King is engaging, if a bit shorter than it needs to be. At its heart, the central theme of King Lear comes through perfectly. That being beware of foolish pride, for it can be very hard to undo the actions that result from this condition-assuming it's even possible to do so. An interesting interpretation with an excellent performance by Jacobi. Also in the cast are Stefano Braschi, Amit Shah, Harry Attwell and Derek Hutchinson.